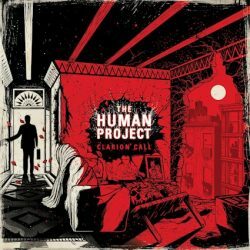 Politically charged Leeds tech punks The Human Project return with their new album Clarion Cell, released on 6th July. Where their previously released album ‘Origins’ released in 2013 through Bird Attack Records preached a heartfelt message of unity and of tolerance for your fellow humans, the Yorkshire based quartet (which features ex/members of Crazy Arm, Random Hand and Sounds of Swami) have like many others seen their attitude shift over the course of the last few years. A shift brought on in no small part by the sudden rise of Trump, Brexit and the so-called ‘alt-right’. “Origins focused on seeing both sides of an argument, fact checking and encouraging those people who vote for right-wing parties to see the damage done to others and themselves. The difference now is we’ve lost our patience somewhat. The Brexit vote was a slap in the face (particularly for younger people) and should be a wake-up call that much greater political engagement is needed if we’re ever going to see another non-tory government”. Five years in the making, Clarion Cell is a labour of love that pays off with aplomb. Riotous and immediate at every turn, this is punk rock with something extra. Extra guts, extra passion, extra talent. The vocal harmonies play off against the powerful riffs and explosive rhythm section to create an enthralling listen. The band worked extra-hard to develop every aspect of the record to its fullest. Vocalist, Guitarist, Luke Yates who works as a sound engineer doubling up his efforts to help capture the delicate vocal harmonies that underpin the album. While, bassist, Joe Dimuantes laid down not only has native bass and vocal parts but also drums on the recordings, covering for recently departed drummer Dan Powell who had moved to Moldova. ‘Desperate Measures’ is the first track on the album to grab the attention with it’s progressive punk tones – the guitars while being powerful and immediate, have a technical prowess above and beyond and beyond their contemporaries. ‘That One Percent’, unsurprisingly, is politically charged and rousing (we’ll let you connect the dots on the subject matter) while ‘The Rhetoric’ combines the relatable lyrical content with the insatiable punk energy. From there on in the album goes from strength to strength with ‘Knocked For Six’ and ‘What We Always Do’ standing out as exceptional tracks. The pace and urgency of the latter gets the blood pumping and plays as the perfect foil to the straight-forward punk rock of ‘Blame’. Both ‘Pride Before A Fall’ and ‘A Debt To Society’ act as masterclasses in technical punk. Wonderful stuff. Relevant and captivating, The Human Project have pulled this from the top drawer. Get this listened to.